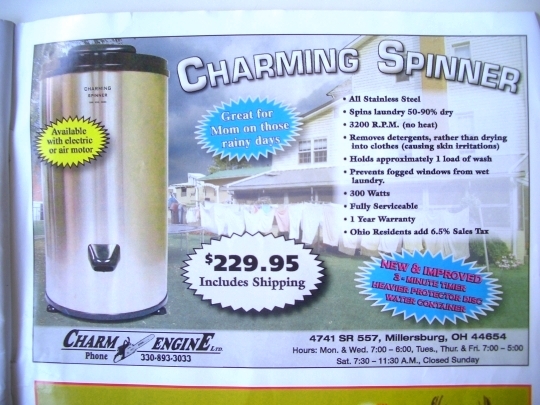 I recently heard that a number of Amish in the Lancaster County community have begun using regular electric washers (like any English home might have, except powered by the diesel generator). With the widely-used wringer washers (ie, the old Maytag style), the clothes are still pretty wet when you finish. Using a regular washer, the spin cycle forces a lot of that extra water out, cutting hours off of drying time. On damp days, or during freezing temps when you need to hang clothes in the basement, it makes a difference (you may know the subtle stink that attaches itself to clothes that dry too slow!). The Spinner is a tool that has become accepted among Amish in some communities. It is a large cylindrical device which basically does what the spin cycle does, which is whirl clothes at high speeds and blast out much of the water, speeding up air drying. Is there really a difference between using a spinner and using the spin cycle of an electric washer? Some would no doubt say that yes, there is. This was interesting to learn, but not completely surprising. This isn’t all of the Lancaster community, still a minority, but apparently a pretty sizeable one. I’ve also been hearing about a more creative use for the conventional electric laundry machine. It seems they come in handy for produce growers. A few minutes on spin cycle and your previously-damp lettuce leaves are ready to pack! More on how Amish wash clothes. Did you ever get anything caught in a wringer?or ruined a couple of shirts? Thanks for the reminders . I used washtubs and a wringer for quite a while, until we moved into houses that had laundry appliances. I still prefer them, but I don’t have a big family and diapers to wash, either! I don’t think that the wringer does such a poor job, but it takes a lot of time. The replacement wringer washers have gotten pretty expensive, and a second hand electric spinning washer can be had much cheaper. I can understand the switch. Blessings, Alice who really does not know what to say about the changes in some Amish communities, LOL. We have an electric spinner in the communal laundry room in my building. It looks pretty much like the one in the picture but older. I have only used it to get the water out clothes that I have had to hand washed. It works! We had both a wringer washer (growing up)and a spin-dryer (washer with separate spin dryer next to it, in the same housing). I think we were the only ones in my extended family (aunts, uncles, a few within the same neighborhood)that had such a “primitive” laundry “arrangement”. Everyone else had electric washers & dryers. The washer/spin dryer was labor intensive to use, as you had to haul the heavy, wet laundry up out of the tub and plop it into the spin dryer. Since the spin dryer was smaller than the wash tub, you could only put a limited amount of laundry in to spin at a time. I used to help my Mom, but she was afraid I’d get my long hair caught in the spinner & it would break my neck! (It had a cover, but I liked to watch it spin without the cover on.) We’d hang clothes outside sometimes (when the commercial laundry next door wasn’t spewing black smoke from their coal-fired boilers—this was before the EPA). The rest of the time (MOST of the time) we’d hang clothes to dry in the basement. Sometimes (humid, summer weather) they’d take forever…mildew would set in, and, as Erik said, they’d scent the air with that “subtle stink”. I sometimes still dry things indoors, but only “delicates” or other hand-washed, fragile items (I use my grandma’s old circular wooden air dryer). What can I say? Laundry never ends, and has to get done, somehow. I wish my mother would have known she could get a separate spin dryer. Maybe she’d have had more time to paint her watercolor landscapes…which makes me wonder what the Amish do with the time they save on doing laundry (those who are allowed to use electric spin dryers, that is). the same type of folding clothes racks that are still sold in Amish variety and hardware stores. The picture at the top of the article shows how the Old Order Amish in Unity, Me do their laundry. They get what water they can out with the wringer before hanging the clothes outside (mostly) tho’ some do dry their clothes inside in poor weather. When I was first married in the 1960s I did my laundry in a wringer washer, and had 2 kids in diapers, so know well the work it is. Mom was glad when automatic washers came along circa 1950. This was because she got her hand caught in the wringer. My first apartment was a studio apartment with a washer like that in the basement for tenants to use. And I always used it, rather than paying to go to a laundramat. It seems to me it was enjoyable to use, and the wringers did a fine job of getting the water out of the clothes. Of course at the time, I was only washing for one person, & it was a relaxing way to spend a bit of time. There were clothes lines in the basement to hang the clothes at the time, & I also have lines now. It seems clothes stay newer & last longer when hung to dry. In the winter, with the furnace running, clothes dry quickly and the added moisture in the air is welcomed. My rent then was $35 mo. for the furnished apt. That amount won’t pay to shovel my walk & driveway today. I have a washer and dryer but hang my clothes out when weather permits. I also use racks in the winter time instead of dryer. Clothes dry overnight and I save money on electricity and clothes last longer. I remember using one of these….these were the best washers ever.Washing in the summer was fun, but definitely not in the winter….when you had to hang them out on a line. BRRRRRRRRRRRRRRRR….Love my washer & dryer now……..and I still hang up a lot of my wash in the laundry room of course…saves on electricity……..
I’m just 49, but my mom had a wringer hooked to her laundry sinks…we would use that sometimes for hand washables….broke a few buttons though….and jeans were a bugger with the metal button. I love to hang clothes out on the line even with a large family. They smell fresh, and I can dry multi loads of heavy jeans, and work clothes so much faster on a warm day. I love the in house washer n drier for winter though. I do remember mom hanging clothes inside in the basement in the winter even with electric appliances to save money and add moisture to the air. My Grandma remembers not only using them for wash days, but also for shelling large loads of peas! That always amazed me….The peas popped out one side as the pod was taken in by the wringer. I also used the drying racks and one of my sons uses them to economize as a newlywed on a tight budget paying electric along with rent….his wife had me hunting garage sales for extra racks so she could wash more than one load at a time. I was reading the other comments, one ask about getting things caught in them. Yes I got my hand caught in it and broke several fingers, no fun. I hated doing laundry with it after that. Sorry to hear about your fingers Sara. Another “unglamorous” aspect of Amish life! They’re not too quiet either with the generator going. I stayed with a wonderful family in Guanajuato, Guanajuato about 5 years ago while learning Spanish and learning about Mexican healthcare. My hostess had a traditional washer and dryer on her rooftop patio, but she preferred her manual washer with an attached wringer. The clothes lines were in the same are on the roof. I spent several afternoons up atop this wonderful house doing laundry (the tub had a timer) , rinsing and spinning out my clothes and the hanging them to try. Granted, I only had to do my own personal laundry, but it was a very satisfying time. I would love to locate such a washing machine! 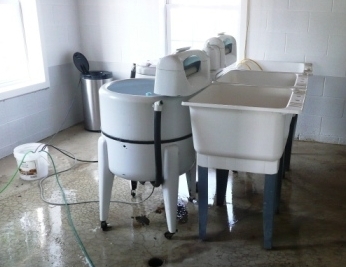 Some Amish communities have washer shops where they do repair and may sell the old versions as well. I understand there are also replica models available.